You’ve heard of “Greenwashing.” My favorite posts on this matter are at The Good Human. But what about a fraudulent “breastfeeding support kit” from a formula company? Wow! Ain’t nothing like finding this crap offer during World Breastfeeding Week! A sample of the NEW Enfamil® PREMIUM™ with Triple Health Guard™, our closest formula to breast milk, should you choose to supplement. Breastfeeding mothers need support, especially the first time around. But a box containing pills and powders is hardly the educational tool it’s purported to be. There are support groups, counselors, discussion boards, and real live doctors should you need help. “If you should choose to supplement” terminology. I wonder how many feminists they polled before they came up with that wording. Want freedom ladies? Freedom of “choice”? Enfamil can help. Puh-lease. 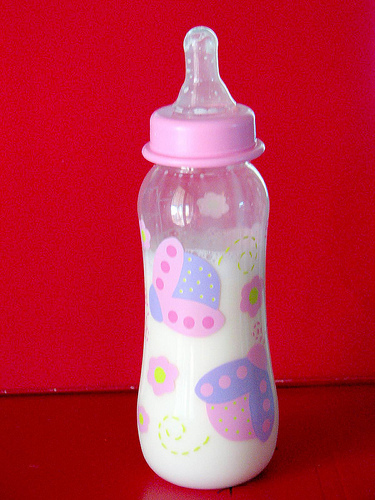 Most families who choose to use formula use it after struggling with breastfeeding. Let’s not make it sound like decisions over infant health is comparable to, say, picking out an outfit. A breastfeeding support kit from a formula company is like a vegetarianism support kit from a pig farmer. This “breastfeeding support kit” is available not only during WBW, but year-round. However, the Free Stuff Times should probably consider the appropriateness of posting this freebie this week (or month, or year, or ever!). I’m not aware of any studies that have observed any health benefits of formula feeding. That’s important, and any mother weighing the benefits of breastfeeding vs formula feeding needs to know that. Still not sure? Check out my post on the “Formula is Voldemort” study, in which it was shown that researcher routinely avoid using the word “formula”in studies that compare the health effects of breastfeeding versus formula-feeding. Instead of saying that formula has negative health effects, they choose to say that breastfeeding protects against these problems. Image: brokinhrt2 on Flickr under a Creative Commons License. Wow the name of the kit just kills me! I fail to see how it supports breastfeeding in any way. I’ve heard that moms who start out breastfeeding but supplement with or switch to formula later on (like when they resume working outside the home) actually use formula longer than moms who exclusively formula feed from the beginning. The latter typically switch to cow’s milk before the recommended age of 12 mos. If U.S. women got a year’s worth of paid maternity leave like many other developed countries offer, *THAT* would be true breastfeeding support. Most moms I know who weaned their babies before a year did so because their maternity leave was up and they didn’t want the hassle of pumping.